Warm weather is coming our way any day now. With spring officially here, let’s celebrate the end of a cold, nasty winter by getting out of the gym and spending more time outdoors. Most people think an outdoor workout involves one thing: running. But if you get a little creative, you can work your entire body using a piece of equipment that’s readily available in parks and greenspaces across the region. 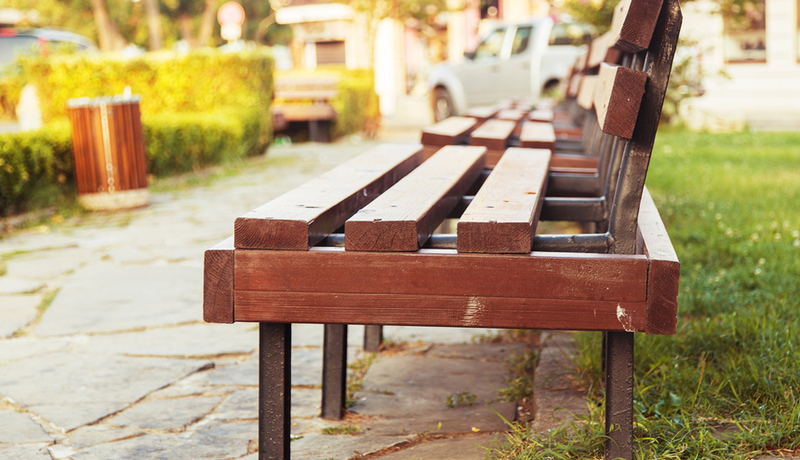 You guessed it: I’m talking about benches. The following two-circuit workout is a full-body blast that can be performed on a bench or any readily available ledge. Complete 20 reps of each exercise in Circuit 1 (10 for each leg when alternating) for three rounds with no breaks. Take a one-minute break before moving on to Circuit 2. Complete 20 reps of each of those exercises for three rounds. Once you’re done, feel free to take a seat and enjoy the view from your new favorite exercise equipment. Side step-ups: Stand parallel to the bench, bench is on your right. Step your right foot onto the bench seat. Extend your right leg and drive yourself upward to raise your left side off the ground. Lower your left foot back down and repeat. Triceps dips: Sit on the bench with feet hip-width apart and straighten legs out in front of you with weight in your heels. Place your hands at your sides, gripping the edge of the bench, and extend arms to raise your glutes from the bench. Slowly bend your elbows and lower glutes down past the bench seat, bringing your elbows to a 90-degree angle. Continue to flex and extend to original position. Seated sit-ups: Lie on the ground facing the bench and bring your legs up to a 90 degree angle, resting on the bench seat. Cross arms in front of chest and slowly raise up to meet your knees. Lie back down slowly and repeat. Skip-ups: Stand facing the bench. As quickly as possible touch alternating toes to the top of the bench seat. Bridge lift: Lie on the ground facing the bench and place feet on the bench seat. Drive through your heels raising your hips off the ground until your body forms a straight line from your knees to your shoulders. Return to original position and raise again. Decline push-ups: Place your feet on the bench seat and get into plank position. Palms should be directly under your chest. Slowly flex elbows and keep at your sides while lowering your chest to the ground. Extend arms fully back to plank position. Plank twists: Get into plank position as described above. Turn right hip up and raise right arm to the sky opening your chest to the side. Return to plank position and alternate to your left side. Burpee to bench jump: Standing facing the bench. Bring your hands down to the seat edge then jump feet back to plank position and immediately back into squat position in front of bench. Propel yourself into a jump landing with both feet on the bench seat. Carefully step back down to the ground and repeat. Jaime Sutton, Owner and Head Trainer at J’aime Fitness in Fairmount, shares her passion, commitment and enthusiasm with personal training clients throughout Philadelphia. As an American Council on Exercise (ACE) certified Personal Trainer, Aerobics and Fitness Association of America (AFAA) Group Exercise Instructor and former NCAA Division One athlete, she wants to bring her unique athletic experience and knowledge to fitness enthusiasts and amateurs alike. Reach her at train@jaime-fitness.com.